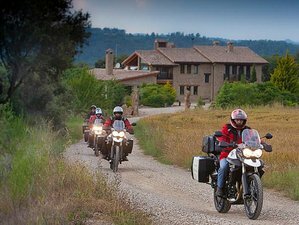 Take part in this spectacular motorbike tour from the north to the south of Spain on the best roads, ideal for motorists who appreciate the wonderful views of incredible landscapes. You will stay in various places along the journey and you will have the chance to taste the gastronomy of each area. Let yourself be free on this wonderful trip by joining now and get to experience the pleasure of riding across the country! You will be staying at various accommodations in hotels or rural houses along the tour routes. The motorcycles available for rent are Triumph Tiger 800, Kawasaki Versys 1000, and BMW F700 GS. They are all equipped with suitcases. You will arrive in Barcelona. This is the first day of riding for you. You will be riding the route that takes you from Barcelona to La Seu D'Urgell. On your second day of riding, you will take the route from La Seu D'Urgell to Pont de Suert while continuously enjoying the beautiful views. From Pont de Suert, you will then ride to Ainsa. Enjoy the ride while seeing the best that Spain has to offer. You will take a circuitous route and ride from Ainsa through scenic routes and then ride back again to Ainsa. On this day, your ride will take you from Ainsa to Cellers. The ride will take you through exciting and winding roads. Today will be a day of rest and your ride will be significantly shorter than the days before. You will ride from Cellers to Andorra. Your day will be spent riding back from Andorra to Barcelona for your departure on the next day. This will be the longest ride you will have during the tour. Today is your last day of the tour and you will depart from Barcelona. There is the possibility to rent the helmet. For other equipment, you are recommended to bring it as well as the helmet if possible. You can also buy them at a good price. You will be accompanied in the store if you need help. This tour will take place in Spain, going through Barcelona, La Seu D'Urgell, Pont de Suert, Ainsa, Cellers, Andorra, and back to Barcelona. The price of the package includes daily breakfast and dinner. The food will be the typical gastronomy in each area. You have the option to have several visits in different places with charm. Please book your flights to arrive at Barcelona-El Prat Airport (BCN).